Through the 2009/10 round of the Recreational Fishing Grants Program - Large Grants Program, almost $2 million will be allocated to 20 projects to improve recreational fishing in Victoria. Through the 2009/10 round of the Recreational Fishing Grants Program - Commissioning Grants Program, over $1.7 million will be allocated to three projects to improve recreational fishing in Victoria. Recovering waters fish stocking program - $536,425.82 to restore Victoria's recreational fisheries in previously drought-affected lakes and impoundments. A report is tabled in Parliament in October each year concerning all RFL Trust Account revenue and expenditure. A report is available for revenue spent in 2009/2010 (PDF - 1.9 MB) and for previous years. The following is a summary of RFGP projects funded from 2009/10 RFL revenue. Unless otherwise stated, these projects are listed under the Department of Economic Development, Jobs, Transport and Resources (former) Department of Environment and Primary Industries region from which the project application emanated. A new fishing platform at Bemm River. A new fishing platform provides convenient access to Tarra River. $232,947 to conduct an Eastern King Prawn stocking program at Lake Tyers. $215,781 to improve fish habitat improvement in the Gippsland Lakes tributaries through the installation of root balls, logs & timber structures in the Mitchell, Nicholson and Tambo Rivers. 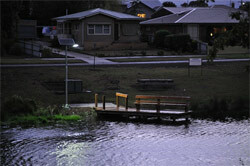 $84,560 to construct a fishing platform, access paths and solar lighting at Sydenham Inlet, Bemm River. $23,400 to construct a designated fishing platform, upstream of tannery Road bridge, Tarra River, Tarraville. $19,200 for fish habitat improvement at Cobungra River, near Omeo. Placing logs to create fish habitat in the Broken Creek. $150,100 to increase fish habitat in the lower Loddon River, Macoma main channel to Kerang Weir and lower Pyramid Creek. 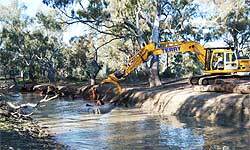 $75,000 to restore native fish habitat through the installation of large woody debris at Broken Creek between Numurkah and Nathalia. $60,000 to improve fish habitat through the installation of rocks, logs and root balls at Nariel Creek, between Colac Bridge and the Nariel Festival Grounds. $17,902 to construct a fishing platform, fencing and a shelter at Serpentine Creek, Durham Ox. 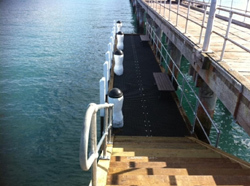 New fishing platform at Flinders Jetty. $300,000 to conduct research into improving sustainability of sand flathead stocks by assessing whether or not fishing activity is having any impact on the decline of sand flathead numbers or if the decline is due to other reasons not related to fishing. $100,000 to construct a designated fishing platform at Flinders jetty. $42,000 to conduct a pilot program which aims to integrate recreational fishing into the Victorian Educational Curriculum through a pilot program at Belmont High School. $212,100 to quantify the recreational southern blue-fin tuna catch of game fishing and charter boat sector. 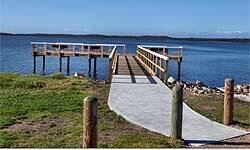 $105,667 to create safe all-weather access for recreational fishers at Taylors Lake, Horsham. $62,150 to construct five fishing jetties at Cobden Lake, Cobden. 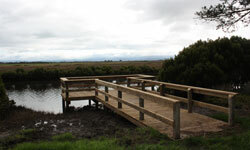 $60,000 to construct a boardwalk, fishing platform and angler access at Aire River, Horden Vale. $30,000 to co-fund the construction of a fish-way at the Lower Breakwater, Barwon River. $15,885 to construct a fishing platform and replace the footbridge at Curdies River, Curdievale. 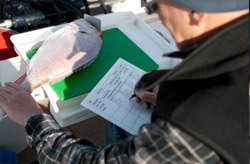 Anglers provide valuable fisheries research through the Angler Diary Program. 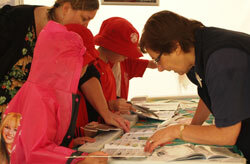 A Figh Right workshop being conducted at Briars Homestead, Mornington for junior anglers. $99,330 to run angler research diary programs monitoring fish stocks targeted by recreational anglers to determine if fish numbers are increasing, decreasing or remaining constant. $90,000 to conduct 300 Fish Right workshops for junior anglers.